Looking for a special and unique holiday season project that is focused on family history? Something that could also be a centerpiece at holiday meals? 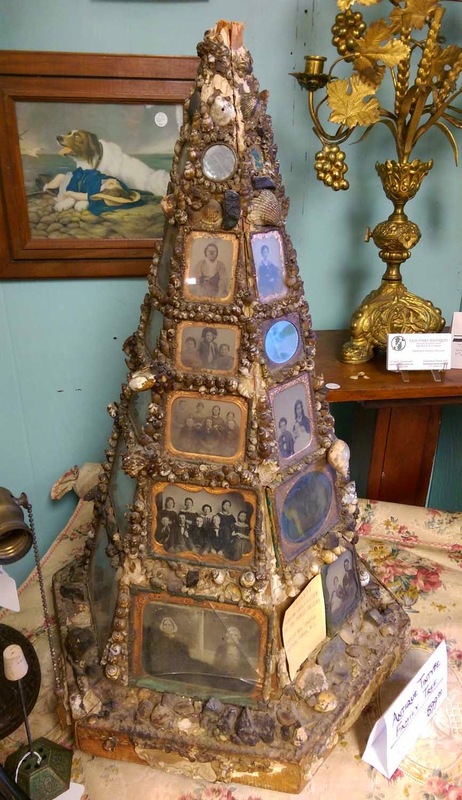 Take a look at this antique piece of Victorian Americana: A folk art family tree! This is most definitely not your Styrofoam & glitter family tree craft project! You can search for tintypes and other antique photos with frames; cheaper yet, search for broken cases, like this . You can search for antique metal picture mats. If you're especially crafty, you can probably create something out of metallic gold picture mats. There's also Modern Day Antique, where they make & sell reproduction gold picture case mats (from resin). Prices range from $5 to $25, depending upon size. Of course, you can also just search for some small picture frames that capture the look and feel you want. (Sometimes the dollar stores, the craft stores, and even WalMart have lots of cute little frames -- for cheap. Usually not when I am looking for them lol) Just remember that you want to make sure that they are not too thick, with flat backs (no easels) so that the plaster can hold them; and that they are sealed nicely so the plaster won't damage or distort the images you place inside. I'm sure this all can sound overwhelming... But once you're done, you'll have a family heirloom piece for sure! PS Make sure you keep a record of all the family members in the photos and keep it with the family tree. (Perhaps adhere it to the bottom of the piece.) That way future generations will know who is literally on the family tree! At that last estate sale I helped my parents with there were a number of old bottles. Old dirty bottles. Even long after the house was built, in the early 1970s, the owners would do some gardening and find old glass bottles in the ground. Apparently, they had built on land that previously had been the old farmhouse dumping ground. 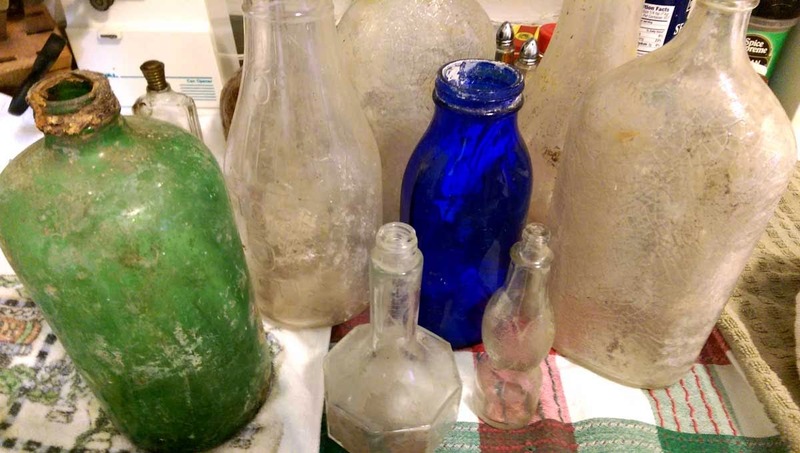 Some of these bottles had been in the ground for 100 years! 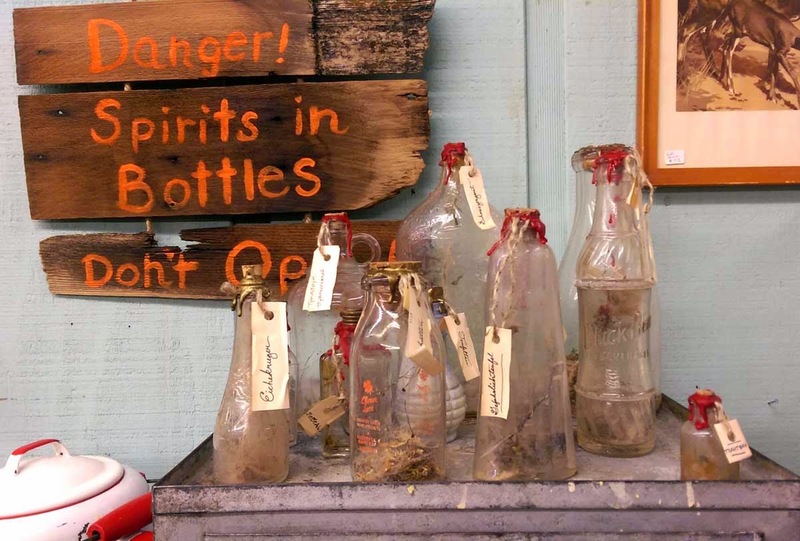 While the family had rescued the bottles from the earth, they had simply put them in the garage or potting shed. As is. Meaning they all needed to be cleaned. 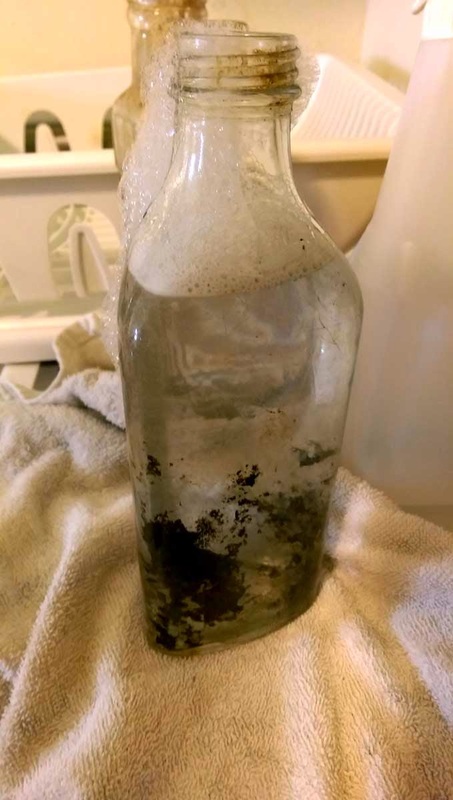 To safely clean old antique glass and vintage bottles (without paper labels) found in the dirt, here's what you do -- but remember, always handle these old bottles carefully, looking for any chips and cracks in the glass or parts of broken metal lids that could be dangerous. Step One: Soak them in warm soapy water. Any dish washing detergent will do. Step Two: Pour the dirty water out of the bottles and rinse them a bit. Use a tweezers to pull out larger chunks of dirt and debris (including the little dead bodies of mice *shiver*) and to pull off any rusty remnants of bottle caps or lids. You'll probably need to scrub some areas. I recommend using a toothbrush. Not only do the bristles get under edges where bottle caps and other lids were, but it is narrow enough to get inside most of the openings so you can scrub a bit of the inside of the bottles as well. You won't be able to reach all the dirt this way, but some sometimes that loosens enough that soaking a bit longer will get the rest out. If not, you'll probably need to get a tub full of fresh warm sudsy water and try a new approach. Step Three: Fill a bottle about half-way full of warm sudsy water. Cover the opening of the bottle with your hand, and shake. The agitation of the water will jar a lot of the dirt loose. If that doesn't get enough of the dirt out, cut a small piece of Brillo or steel wool scrubbing pad and again, with your hand over the mouth of the bottle, shake. This time, the steel wool does the scrubbing and scraping. You'll need to turn the bottle in different positions to focus the scrubbing on specific areas, but eventually, you'll get all the dirt out. Step Four: Disinfect the bottles using a mixture of bleach and water (I like to use 1/4 cup of Clorox bleach per one gallon of water). Let the bottles soak in the bleach water for at least five minutes to ensure they are disinfected. Then rinse. Step Five: Let the bottles dry. Step Six: Now that the bottles are dry, inspect them. Those that have dangerous chips should be tossed (unless you have another project in mind for those -- more here). But those with brown rust spots, white mineral deposits, etc. can still be saved by using CLR, Calcium, Rust and Lime Remover. Rinse thoroughly in cold water after about two minutes. Reapply and repeat as necessary. You may also wish to let the bottles dry before trying the mixture again, to see how they really look. Most of the bottles will be clean enough to display. However, some will be too cloudy, etched, and damaged to be in collectible conditions. Since Halloween is almost here, I turned most of those not-good-enough bottles into spirit bottles! Quick & Easy Halloween Party Treats -- includes nut-free options! A Beginner's Guide To Flatware, aka silverware. Hand Washing Dishes Is More That "Just A Tradition": info on health, the environment, thrift, etc. Especially important for the upcoming holiday seasons as it offers the best practices for taking care of your antique china, crystal, silverware, vintage glassware, and other dishes! Find more of my eBay Guides here . My friend, Suburban Diva ®, has a contest: Disney and Kohl’s are giving one of you a $50 gift card. Marzetti has a recipe sharing contest; a chance to win a $250 gift card and coupons. 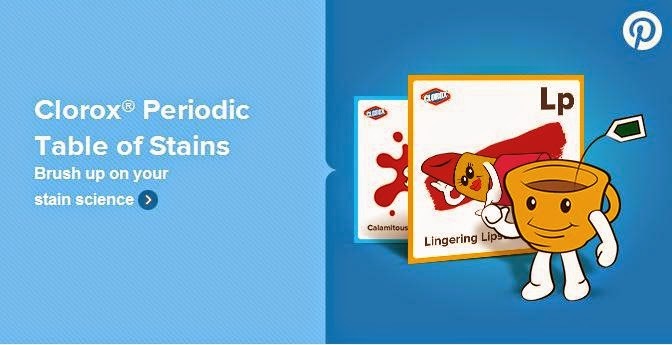 Have you seen the Clorox Periodic Table of Stains? It's on Pinterest. It's really all about using Clorox, but the images and descriptions are kind of cute. (And how many times can you say talking about stains is "cute"?) If you are member of Social Moms, you can earn points for sharing the pins -- not only the Period Table of Stains pins, but Social Moms' Cleaning & Household Tips pins too. Winter isn't over where I live, is it over by you? For those of you struggling with propane shortages and costs, I've tried these wonderful eheat wall panel heaters -- and I love them! Here are 5 simple ways to make your home a little greener. Green thumb or not, antique seed planters still work! Whether you are going green, reconsidering the healthy aspects of dryer sheets, or just want to save money by not using them, here are 7 ways to avoid static cling in the laundry without 'em. Speaking "7", are you making these 7 recycling mistakes?